May 30 is National Mint Julep Day. This drink was introduced at the Kentucky Derby in the 1930s and since then it has become the event's official drink. 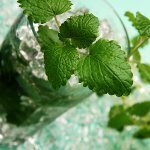 Mint julep is the best refreshing summer drink, that is made of water, sugar, Bourbon and spearmint. It's similar to Mojito, but rum was replaced by Bourbon. Bartenders have their own trick, that lets mint release its flavor. Bruise mint leaves a little before you add other ingredients, then you'll have a flavorful drink. We give you the easiest recipe of mint julep, that you can make at home. Muddle two sprigs of mint with 1 1/2 tablespoons of brown sugar and 1 ounce of Bourbon in a julep cup (you can take an old-fashioned high glass, if you don't have a cup). Add some crushed ice and 1 1/2 ounce of Bourbon. Garnish your drink with a sprig of mint. Invite your friends over for a party with homemade mint julep. Enjoy this unique drink even when Kentucky Derby is over. The refreshing taste of mint julep is perfect for any hot summer day.